One of sailing’s rites of passage is the first extended offshore trip — a small boat on a big ocean, with no land in sight for three, four or more days. The skills and knowledge to deal with bluewater sailing differ from the coastal sailing skills that have already been developed. The techniques of sailing the boat are the same, but your exposure to the weather and seas is significantly greater. The availability of outside help is limited; self-sufficiency is key, and boat preparation is paramount. 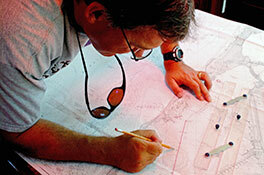 Blue Water Sailing School offers courses to prepare students for such a trip. 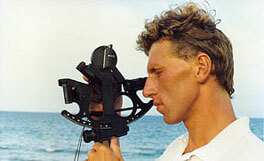 These courses offer the ultimate in sailing education: Celestial Navigation and Offshore Passagemaking (ASA courses 107 and 108). ASA 108 Offshore Passagemaking has every other ASA course except Cruising Catamaran as prerequisites (that’s ASA 101, 103, 104, 105, 106 and 107). Students should also have some significant coastal sailing experience as a captain or watch leader. After completion of these courses, students will also be asked to complete a 3 day passage and submit a log of the voyage — including celestial sights and fixes — for review. You will have one year from the date of course completion to fulfill this requirement. Due to the comprehensive nature of this course there is no one textbook. There are several books that can help you in your studies and provide valuable reference material on your future sailing adventures. You can find our recommendations in the Offshore Passagemaking Reading List. The offshore passagemaking voyages are a little different each year. The schedule and pricing details for this year’s trips can be found here.